The 6 kid and baby apps you need in your life. These days we’re pretty spoilt for choice when it comes to all things baby and kid. There are many things that help make good old mum life easier. There are also things that make life a lot harder, such as when you finally get home after a torturous shopping trip with the kids in tow, only to realise you forgot to buy nappies and/or milk – cue forehead slap (yes, I’ve been there, as we all have!). 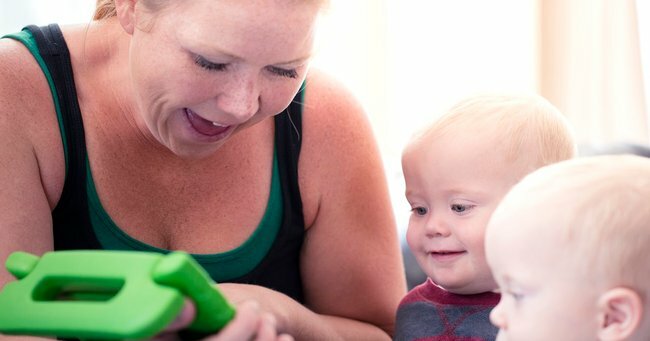 Mums are online more and more these days, so it’s no surprise that there’s a booming industry of kids and baby applications for phones and tablets. Mums are online more and more these days. Image via iStock. With a two year old and nine month old I’ve tried a fair few. So, here are a few of my faves. This app plays different types of white noise to help your bub drift off to sleep. I’ve used this many a time with my two, and it’s been brilliant. It’s not a fancy-schmanzy app but has the basics - a timer so you can set the duration of how long you want it to play for, different noises for a newborn, infant and toddlers, plus you can also record your own sounds (i.e. Mummy’s ‘shhhhhh’). When you have a new baby, every health professional will ask you for a load of detail such as how long bub is feeding for, sleep timings, number of wet and soiled nappies and more. I don’t know about you, but when I was in the newborn sleep-deprived world-turned-upside-down period my brain was complete mush, and there was no way I could remember my own birth date, let alone this sort of detail! Enter the Sprout baby app which meant I could time and record every little detail (usually while I was breastfeeding, heaps of time there!) and just whip it out at any appointment. It also allows you to record key moments, with pictures, and then download a full PDF of their first milestones. Genius. You can record every single detail. Image via iStock. I don’t know about your child, but my eldest is absolutely addicted to ABC Kids. He would watch it all day, if I let him. You can catch up on the best of ABC TV with the free ABC iView iPad app. Enough said. A journal that helps you record key milestones and events, like a ‘baby book’. It’s easy, it’s intuitive, and can help you make up for lost time. You can record things as they’re happening, rather than waiting until you get a moment to sit down and write in a traditional baby book (ain’t no one got time for that, am I right?!). It’s photo-driven and you can captions, longer journal entries, tags, and keywords to your pic. You can then export all your entries to a PDF and print them out. A very simple app that helps teach pre-school children their first words through shapes and sound. All your child has to do it touch a letter to hear what it is, then drag it into the right spot to help spell out the word. There are loads of apps that will help your child learn to read. Image via iStock. A brightly coloured app that helps your child learn about the environment, nature, and animals. Based on the popular children’s song, they can follow the spider through scenes where he goes up the water spout, comes down with the rain, and watches the sun dry up all the rain. They’ll be encouraged to touch and explore.